Can farming save a life? Is there redemption in working with one’s hands and caring for Earth’s creatures? The answer to these questions may be found in the life and experiences of an apprentice at a local farm right here in China, Maine. This past December, I had the privilege of meeting Brandon Holmes – an intelligent, fun-loving, motivated person with a passion for the natural world. Right away, he made an impression as an authentic human being who has overcome unimaginable obstacles to get to where he is in life. As I interviewed him in the apprentice cabin at 3 Level Farm, I was struck by how his story is about more than a simple goat farmer. It’s one about redemption and seizing life by the horns. It’s a story about the power of the individual to change his own life, and the power of the community to support him. Brandon is living proof that connecting with the earth can be one of the most compelling positive forces a person can experience. Reflecting on his journeys in life that took him from a job at Harvard, to homelessness, to finally finding meaning in a simple life on a farm in rural Maine, Brandon fearlessly recounted his life with the perspective of someone who has experienced much more than a typical thirty-something. In the early 2000s, at age 13, he started his own computer business and became financially successful, picking up his first major client at only 15 years old. Eventually, his skills and expertise landed him a job at Harvard University, despite the new and destructive habits which he was already developing. Ultimately, Brandon became a victim of his own success and developed a severe addiction to alcohol. After several warnings from his employer, Brandon chose alcohol over job security and moved to Maine. Though now closer in proximity to his family, he found himself homeless. Even moving to Michigan, becoming a father, and an interlude of sobriety did not provide him with relief from his downward spiral. Unfortunately, he resumed heavy drinking and ended up serving 17 months in maximum security prison for assaulting an officer while intoxicated. After he was released from prison, Brandon found it difficult to obtain employment due to his felony status. Eventually, he moved back to Maine, and in 2017 he started helping his mother run a restaurant. Following that harrowing experience, Brandon was finally willing to commit himself to a six-month recovery and work program in Portland, sponsored by the Salvation Army. By going through this and several other programs, focused on addiction and recovery, he realized he had to make radical changes in his life. As he contemplated the benefits of a simple, healthful life, he thought of the idea to apprentice on a farm. 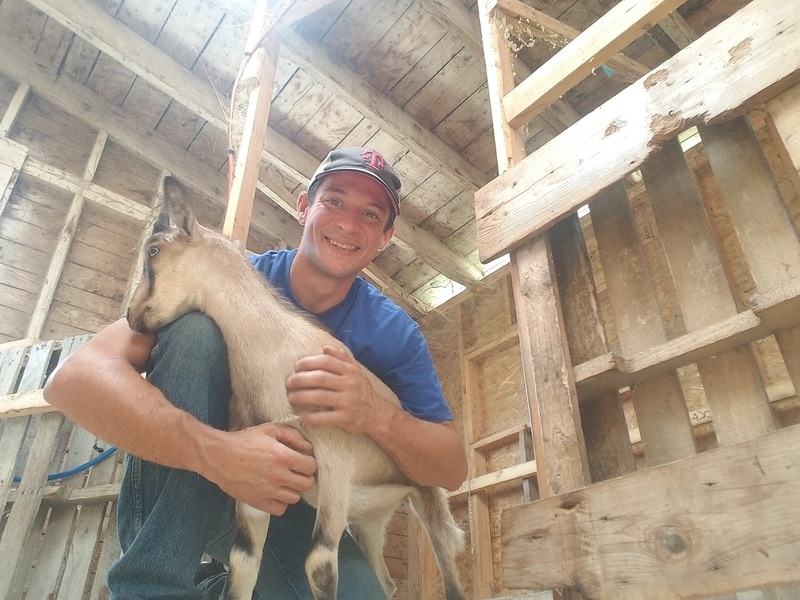 Research through the Maine Organic Farmers and Gardeners Asso­cia­tion’s apprenticeship program yielded a farm in Freeport that was a match for him, and he applied for the position. To his relief, he was accepted even though he had a criminal background. A new chapter of his life was about to unfold, beginning a journey that would acquaint him with the natural world and begin his healing process. After finishing the first year of his apprenticeship in Freeport, he continued his second year at 3 Level Farm, in South China. When he arrived at 3 Level Farm last January, one of Brandon’s first assignments was to observe the moon. “It was really a fun approach to connecting with nature,” he says. Mindfulness of the four directions (north, south, east, and west) was also very grounding and orientating for him. Most importantly, it was essential for him to be a part of a thoughtful community that provided the opportunity to be his best, and who encouraged him when he wasn’t. Since Brandon has demonstrated the dedication and determination necessary to live a sober life, others in his community have taken notice and supported his decision. On one occasion, when he had a relapse with alcohol, the farmer he had apprenticed for handled it effectively and with compassion. Brandon has since been successful in his recovery as a result of this understanding, realizing that the people around him really care and want him to succeed. Most importantly, his personal resolve to deal with life without succumbing to addiction keeps him moving forward. Since I also write The Town Line’s garden column, Garden Works, I had to ask Brandon, what is his approach to farming? In Brandon’s mind, good health through a holistic approach to tending the land and to one’s body are inseparable. Just as the health of the soil and its fruitage depends on being properly nourished and taken care of, he believes the same is true with our bodies. By keeping this in mind, he has been able to improve his own physical and mental health dramatically. He even lost 90 pounds! He takes a similar approach with the creatures in his care. He always ensures his animals aren’t stressed, whether it involves their diet or their mental health and well-being. “I muck the barn once a week so that they’re not in their own squalor, and to keep virus and parasite loads down,” he says. Rotational pasturing also contributes to the health of his herd. 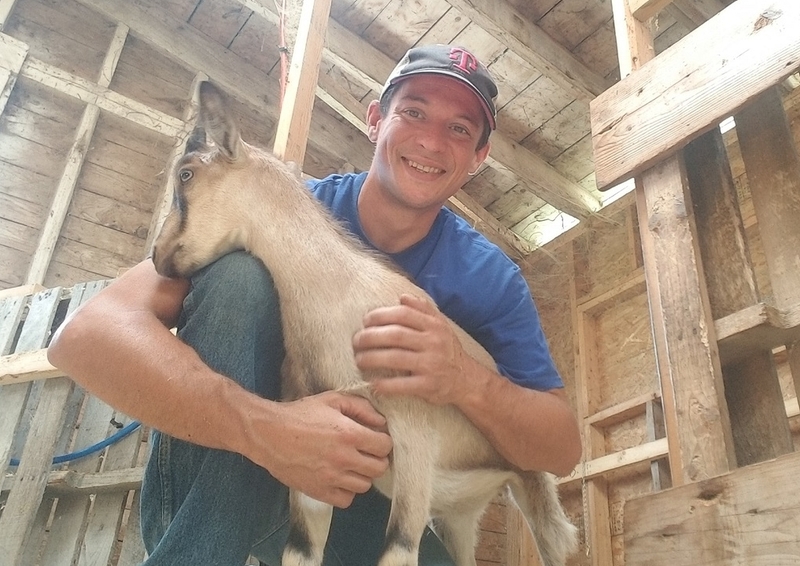 Most importantly, Brandon spends more time with the goats than his work assignment requires, so that he knows them well enough to spot problems early on. “I have a blast with them!” he says. “One great thing about the farming world,” he tells me, “is how helpful they all are. Since I’ve started [a lifestyle vlog and a trending GoFundMe page to help fund it], I’ve had farmers reach out to me from all different areas of the farming world – cheesemakers, a licensed vet tech – who offered to help finish raising money for the GoFundMe project.” It’s that sense of community and support that keeps him going. Also, of equal importance, are the goats that bring meaning, purpose, and unconditional friendship to his life. To Brandon, this is essential. “I feel that society could learn a lot from them,” he says. “I never feel judged when I’m out there with the goats.” To him, caring for goats is a healthy outlet that can help with the rougher realities of the worlds around us and within us. If you, like Brandon, have the same determination to live a sober life and would like to be part of a supportive community that finds meaning in connecting with the natural world, feel free to reach out to him. If you’d like to check him out on social media and be utterly entertained, look up his website “Life Beyond the Burbs” and his YouTube channel. Enjoy, reflect, and see for yourself the joys and benefits of working closely with nature.